Nicholas Jarecki's “Arbitrage” may seem to be about economics and finances at the start of the film. 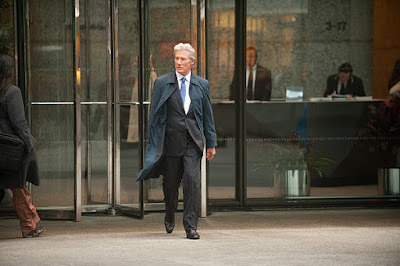 After all, the film is about a billionaire named Robert Miller (Richard Gere) who owns one of those powerful Wall Street companies that seem to do a little bit of everything (so long as there's money coming in). Unknown to the company though, Robert has gambled over $400 million dollars in a private investment that went belly up, and now he's looking to sell the company to help plug the whole. His life gets more complicated though as he gets into a car crash that kills a woman he was having an affair with. He flees the scene of the crime determined not to let anyone know about it. 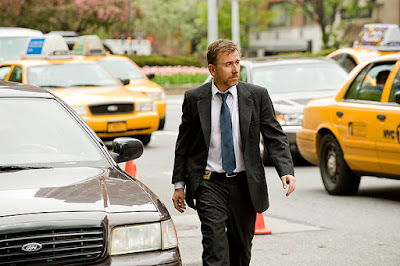 Ah, but he has a private detective (Tim Roth) who is inspecting the crash, and he seems to have a certain…lets say ‘dislike' of billionaires. He knows that Robert was the driver of the car. He can't prove it, but he has one of those senses that only private detectives have. This is when the film becomes not so much about economics and finance, but about trying to balance two fragile situations while making sure everyone comes out a winner. On one hand Robert has to sell his company without anyone figured out he was cooking the books in personal deal he shouldn't have been involved with. On the other hand he needs to keep his involvement in the death of this woman secret if he doesn't want to go to jail. Though his reasoning for doing these things seem selfish, he's not incorrect when he says he needs to take care of these things or else other people will suffer. His daughter is his partner in the firm. 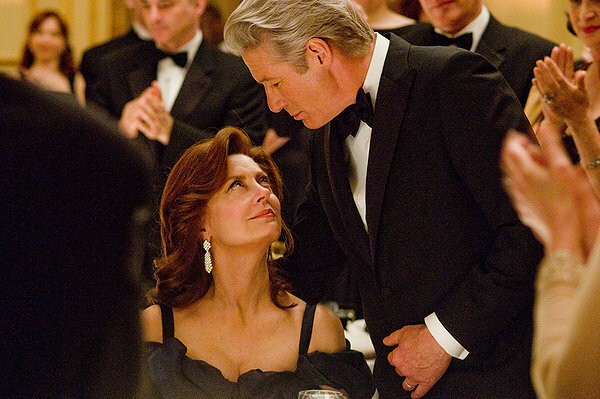 You get a sense that working with her dad was the only way she could spend time with him when her response to him selling the company and retiring is “I just don't know what we'd do together.” If he gets caught in the companies shady finances, then she becomes an unwilling accomplice in it. 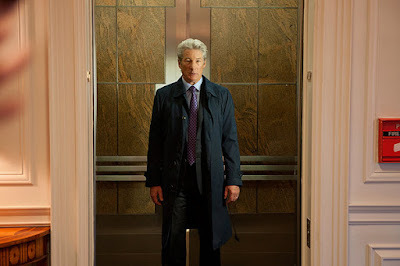 Likewise Robert got a ride home from the accident from a black man named Jimmy (Nate Parker), who is being pressured by the private detective to cut a deal and walk away or go to jail for at least ten years. At the ripe age of 23, the temptation to tell the truth so that there is no consequences is too big to pass up. So much of this movie working depends on Richard Gere, who needs to present Robert as a good guy who does bad things. And in a sense he is a good guy. While wrapping up these complications would certainly get him off the hook, he's more concerned about his family and friends. He's not even above turning himself in if he has to do that so that others will walk. His inner conflict matches the pain inside his stomach that he hides, and it's a great visual reminder to the audience that this is a tormented man who keeps going because he has no choice but to. 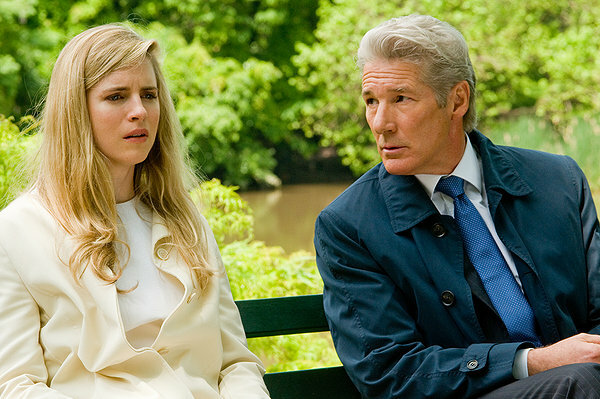 Legal dramas are pretty common stories to tell. So much so that TV is littered with them, and most look and sound the same. 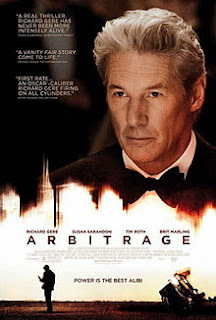 By making “Arbitrage” about a person though the movie opens itself up to being a far better movie than you might expect. This is a movie about a complicated man who created a mess but is doing the best he can to clean it up. Sure it would be easier if he would just come clean about what he's done, but it's more interesting to see if he can get away with it without sacrificing anyone in the process. This is one of those day-and-date releases, which means if you can't find it in theaters you can get it on Video on Demand. Whichever way you decide to watch it is worth your time. Parents, there is some brief, strong language. Recommended for ages 15 and up.